Wearing my new Action Cam proudly as I embark on my new "Flapper Life Moments" journey. With the new and amazing Balanced Optical SteadyShot™, there is a finally a camera that can capture stable footages of my point-of-view! Woof! Truth be told, I never in my wildest imagination thought that I, Flapper Choo, would be running another Sony Action Cam campaign. I was elated and excited. I suffered withdrawal symptoms after last year's "Prove Yourself" campaign with the FDR-X1000V. All that adventures! Woof! [MOST IMPORTANTLY] Capture our life moments - easily. When I first received the FDR-X1000V last year, we were super happy as we finally owned a POV camera. 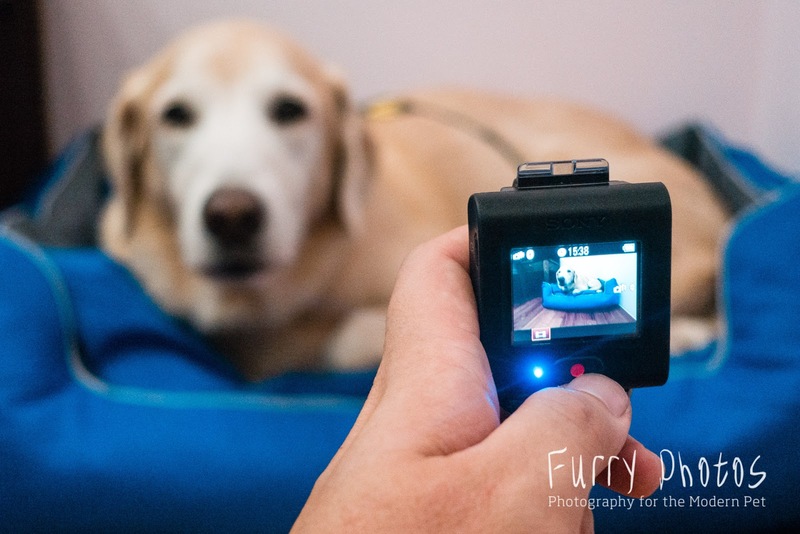 But if you had read my 'Tips and Tricks' and 'FDR-X1000V Review' articles, capturing Frodo and my POVs were less-than-satisfactory (nauseating to be exact) and mummy's major gripe was the dog mount harness. It took mummy many tries before figuring out WHERE to position the harness in order to capture okay-ish usable footages. 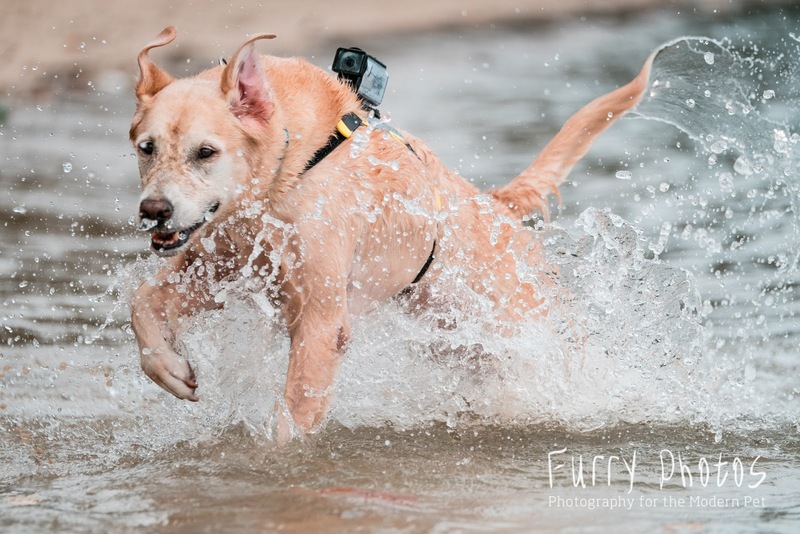 Unlike last year where I was a total novice to the Action Cam, I started #flapperlifemoments feeling like an old pro. And my review then was from a perspective of a new user. This year, being the old blonde with the Action Cam, I will be reviewing on its improvements rather than "How-to-use". This is not a other-cameras-comparative review nor to discredit other cameras review. I am not tech-geek enough for that. This is an honest review based solely on personal experience as a lazy end-user of both the FDR-X1000V and FDR-X3000R. Before I received my brand spankin' new FDR-X3000R, I confess I googled to see if there were any reviews online. The reviews spoke of this Balanced Optical SteadyShot™ as the BOSS but I raised one paw and had my reservations of its prowess. The first action camera that features the revolutionary Balanced Optical SteadyShot™ technology that gives amazingly smooth footages. I was excited to try but I did not raise my expectations too high that the FDR-X3000R could capture stable POV of mine. The moment of truth arrived when mummy previewed the first few footages of my POV and I heard her gasp, "Oh my god... these are actually good POV footages. Oh s***! I am going to have a tough time editing!" 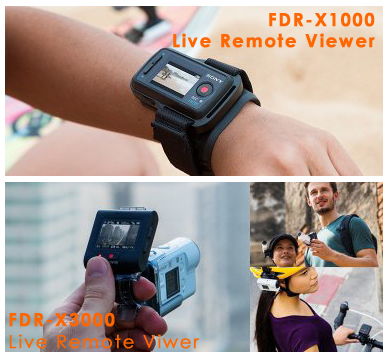 Mummy, who was the one doing all the video edits for the FDR-X1000V, knew immediately the minute she saw the first few footages the marked improvement in stability, colour and clarity with the FDR-X3000R. The real test of BOSS came in Day 2 of my secret birthday getaway - going out to the field to run. The FDR-X1000V did okay with the 'trotting' footages but the 'running' footages... the electronic stabilization could not compensate for the exaggerated body movements. So it was a MUST-TEST to see if the optical stabilization is really all that 'smart'. 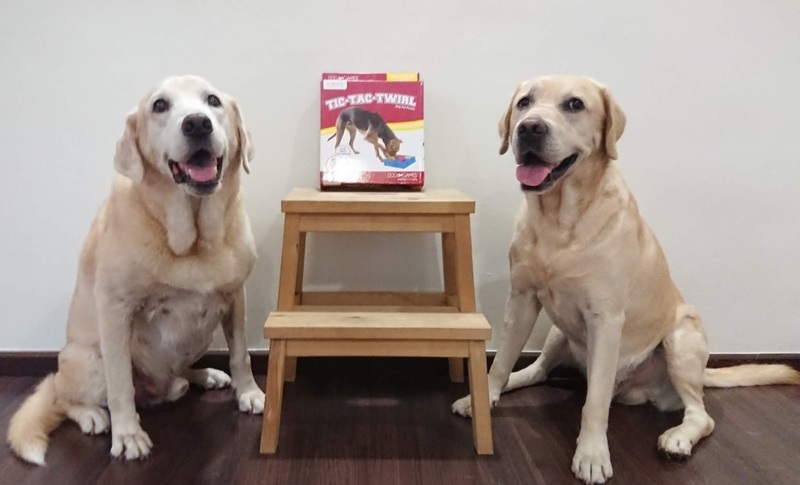 There is finally a POV camera that can capture stable POV of dogs. Without doubt, the handheld (by human) Action Cam footages were better and more stable than Frodo and my POV. And unlike last year where Uncle Nic and mummy had to experiment with the mounting and movement in order to capture stable footages, it was way easier with this new optical stabilization as it is almost foolproof. The new Balanced Optical SteadyShot™ is truly the B.O.S.S.. The Highlight Movie Maker Became A Lot Smarter Too! I did not review on the Highlight Movie Maker from the Sony PlayMemories Mobile app last year because I did not find it very useful. I am not geeky enough to know the algorithm on how it selects the footages but it was clear with the FDR-X1000V that movie maker selects stable footages but erm... most of Frodo and my POV footages were shaky so the Highlight Movie Maker ended up featuring the sand, human leg and God knows what else. I primarily used the Sony Playmemories Mobile app to review the video footages (no sound) and that was it. HOWEVER, I decided to try this Highlight Movie Maker again now that I am capturing very stable images. Perhaps because of the new optical stabilizer that provides good quality stables footages, the Highlight Movie Maker has become a lot smarter too! It can finally pick up varied moments including our POV of us walking, running, swimming, sand rubs, looking at the human etc. I decided to test it again last weekend when I did that silly dog event. I wondered... out of some 25 minutes footages of me roaming at the event which I selected a 1 minute final cut, what will Highlight Movie Maker pick out? Will it pick out my visit to each booth? Will it only pick out my still moments of me staring at the human-treat-dispenser? Will it only pick up the products? Or will it pick up the many moments of me greeting and sniffing my friends? And so I must say, I still have no idea what the Highlight Movie Maker algorithm is but it has become a lot smarter. I was pleasantly surprised by what it picked out and it pretty much captured the essence of me as a Roving Reporter. Somehow... everything seems a lot smarter with this new Action Cam. When I first read my contract with Sony, it stipulated 10 still images to be taken with the Action Cam, I choked on my milk and nearly spat it out. The still image quality was a let down with the FDR-X1000V but I could let it slip by as it was not a function I used very often. My friend from Sony showed me images taken with the FDR-X3000R..... which looked impressive but again, one paw raised. Skeptical again. "I'll try...", I concurred with much reluctance. And I was pleasantly surprised by the marked improvement with the still image quality. Images below are as is. No colour enhancements or adjustments. Frodo showing off his Mister Universe physique and his rare moment of "dignified look". Me, Flapper 'Phelps' showing off that old man still has some moves. Night Swim - Underwater shot me plunging in.... and you don't have to look very hard to see the tornado of fur captured as well! Night Swim - Yet another underwater shot of me trying to grab my tennis ball. My Birthday Burger moment taken under low-light condition at night. My indoor romance moment with my girlfriend. Frodo standing against sunrise.... okay Frodo, I get it. You have gorgeous body. Again, with its predecessor, I did not use the Timelapse function - at all. I may have tried and if my memory serves me correctly, the Action Cam Movie Creator app then did not have the Timelapse movie creator function. With its new app update coupled with the FDR-X3000R much improved still image quality, I could create momentous Timelapse videos of us - from sunrise to sunset moments, dinner with the family.... capturing my life moments became all that much better and meaningful. But of course, with Frodo and myself splashing in and out of the swimming pool, we could not help but add water droplets to the lens. But that tells a truthful story, no? Let's begin with the camera design. a little smaller, a little more compact. BOXIER with a broader flat base. This is a very good tweak. This allowed the camera to sit flatter on me which meant it balanced better on my body too. It also means it lies better on the table too. the same weight as the FDR-X1000 although I keep feeling like the FDR-X3000 is a little heavier. On/Off button added at the top - the FDR-X1000 did not have a on/off button. Menu display easier to navigate although my progressively-blind mummy does complain that she has difficulty the minute display. My favourite added function is the separate microphone option - to turn on/off recording sound effects (i.e. water splashes, our foot steps) and on/off recording human voices. Pretty darn smart! Detachable for mounting on its new accessories - pretty nifty idea and design but can be a little fiddly especially if you have death-fingers like my mama. She has not broken it... yet. Can be used with the old Action Cam. Approximate three times less battery life - I have not done an actual usage count but I remember with the old LVR, I could use it like... forever before having to charge it but with the new one, I do have to charge it almost after each intense day of usage. Separate charging unit - This one does scare mummy a little as she has a tendency to lose things... the old LVR was charged by direct plugging. Super love it for the fact that with the new finger grip accessory (see image above), the LVR and camera are mounted on one unit for easy viewing and recording. Priced at SGD35.00, the finger grip is a MUST-HAVE. Recording with the new Action Cam has gotten a whole lot easier with this wonderful new finger grip accessory. The much-improved Flat-Door Lens that comes with default with the Underwater Housing. What can I say? I was thoroughly thrilled and delighted that the new FDR-X3000R default underwater housing comes with the flat-lens door! Last year, I had to invest into buying the flat-door lens separately as the FDR-X1000V underwater housing came with the concave lens. 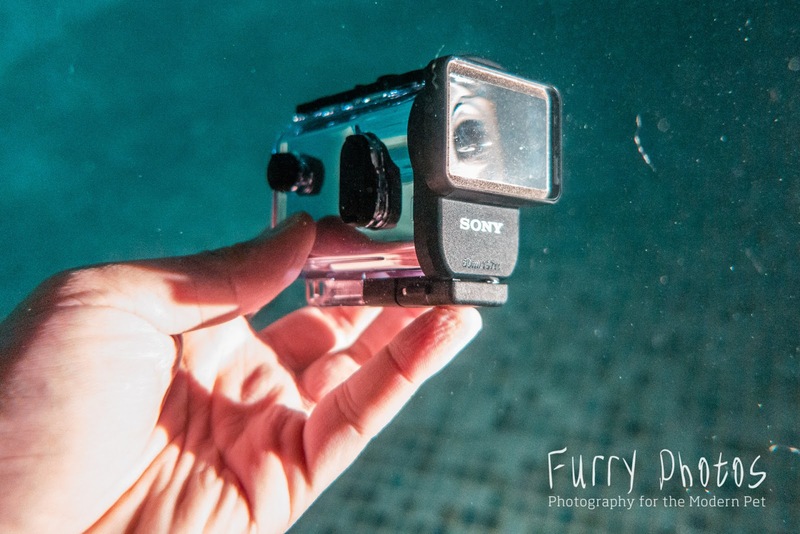 The flat-lens is a MUST HAVE for underwater usage. It takes better and sharper underwater footages/images compared to the concave lens. And of course, the underwater housing helps protect the camera from ME above-water with my incessant love of body rubs. As mummy always says, cheaper to replace the housing than the camera. The new flat-lens door is SMALLER and MUCH IMPROVED compared to the old one. Good news is, it comes default with the underwater housing. That's like a super big paws up! The housing takes the Action Cam up to 60m underwater. Bad news is, you MUST get the anti-fogging sheet separately, which works well, but it can be a little tricky to fit the sheet between the camera and housing. The once-much-disliked Dog-Mount Harness now works beautifully. This is the 'it' moment when mummy has to eat back her words. For those who read our review from last year, we gave pretty bad reviews on the dog-mount harness. Mummy was gutted when she found out that Sony did not tweak or improve the dog-mount harness. Perhaps it is acquired taste.... but after more than a year of using that velcro-laden harness, mummy got somewhat used to it although till this very day, I am still the master of removing it. She still wishes that there's some improvements made to it such that we are able to front mount the camera. The camera lays nicely on Frodo and my body so it does not shift to the side as often = more 'straight' footages rather than head-tilting and crooked footages. 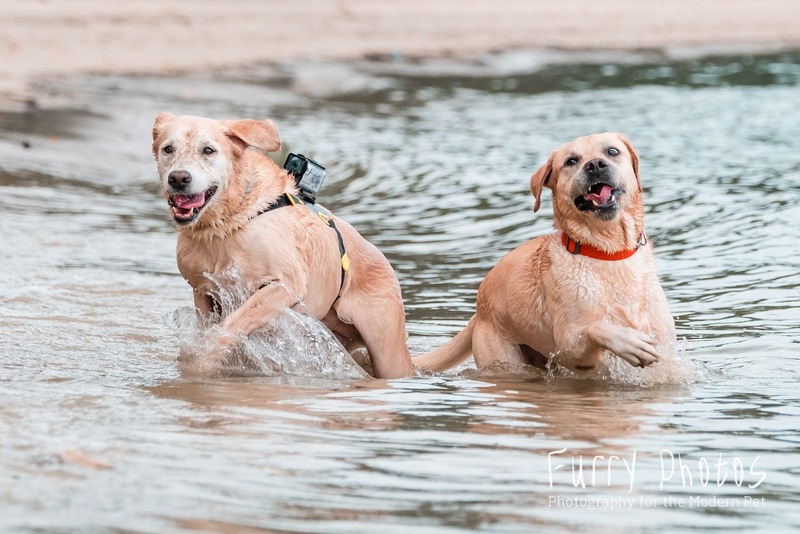 The camera 'automatically' repositions itself to the middle after a violent body shake by us - the dogs. The over-head extension mount can now be used for "walking" footages but still no go for high-action running and jumping. I still do wonder how this harness is going to sit on those teeny tiny dogs. But for where we started from last year, it is funny how the same harness works a lot better now. My rocket-scientist mind tells me, it is primarily attributed to that little tweak in the camera design plus the wonderful BOSS technology that compensated for the harness flaws.... and it works beautifully now! With the new BOSS technology and improved camera design, the camera lays much better on our bodies and is able to capture decent and stable footages from our POV! The once-much-disliked harness is now our good friend with the FDR-X3000R. The FDR-X3000R has won my heart. I tried finding distinct flaws about this Action Cam that I could talk about but it really is a gem with the new Balanced Optical SteadyShot™. I was pleasantly surprised by the improvements made from the FDR-X1000V. Unexpected in the best way possible. Maybe Sony heard my woofs? The FDR-X1000V overall was already an impressive camera in its own rights. 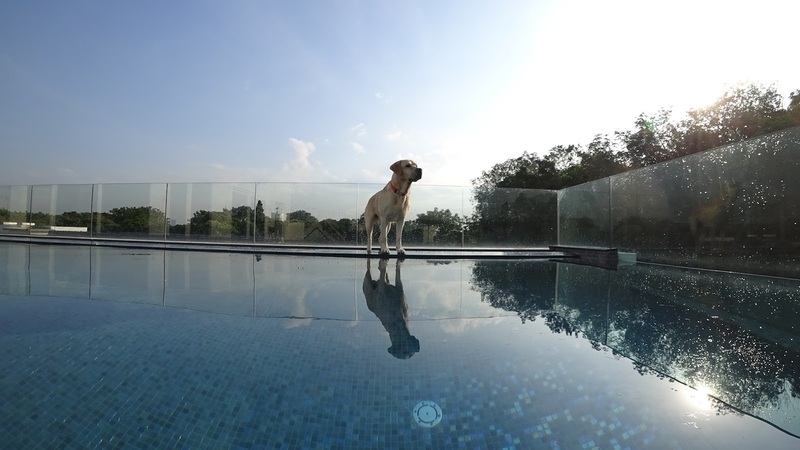 Minus the dog's POV, which is a common problem with POV cameras, it was already pretty smart in taking decent footages under different lighting conditions and environment. But the FDR-X3000R has just kicked its predecessor out of place with its obvious improvements - not just its optical stabilization but the colour, clarity and boast-worthy ability to be used under low light and indoor conditions... me thinks Sony may have just come up with the BOSS of all POV cameras. I will just end off my review with this sweet and short recap video of my wonderful secret getaway that I managed to capture every moment with this to-die-for camera called the Action Cam FDR-X3000R. 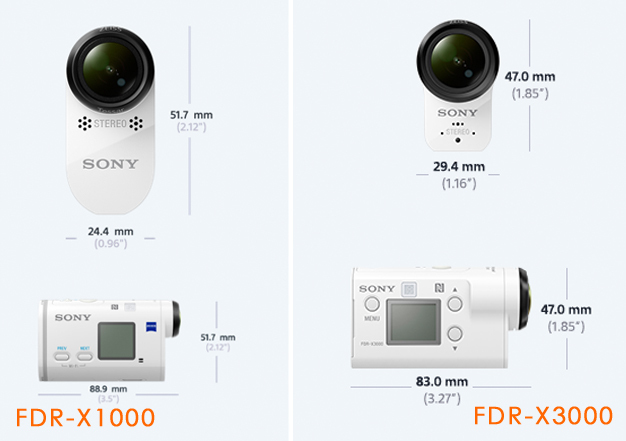 For more information on the Sony Action Cam FDR-X3000R, you can go to Sony Singapore's website. You can feel free to ask me too though I have to tell ya... I am no tech geek and I can only give you honest opinion as a lazy end-user.